Hey there! Welcome to another Corrosive Challenge post! A new challenge starts today bringing with it a new amazing sponsor! This fortnight we are delighted to work with Meljen's Designs! Melissa generously offered the team several images to work with and has a fabulous prize of 4 (non-colored) digis for our winner! There are so many adorable images to choose from too! Check out the shop, the blog, and the Facebook page and see for yourself! There's even a challenge blog! I'm playing along with the current challenge (#199) which happens to be a sketch. One of my favorites things! Our theme for challenge #194 is Animals. I selected Cozy Winter Wolf to work with. My brother and sister-in-law recently adopted a cairn terrier mix from a local shelter and I wanted to send them a card to commemorate the occasion! Their girl is grey so I colored my image to match using my Copics. I cut the image out using my Classic Circles Nestabilities from Spellbinders and matted it on Star Circles. Paper is DCWV Rock Star Silver Foil. I added a sentiment from My Favorite Things' Essential Sentiments set stamped on a Ribbon Banner die cut as well as some Jolee's Boutique paw prints and a Philosophy Tag and jump ring from Tim Holtz (the latter reminded me of a dog tag). The pink ribbon I found in my stash. 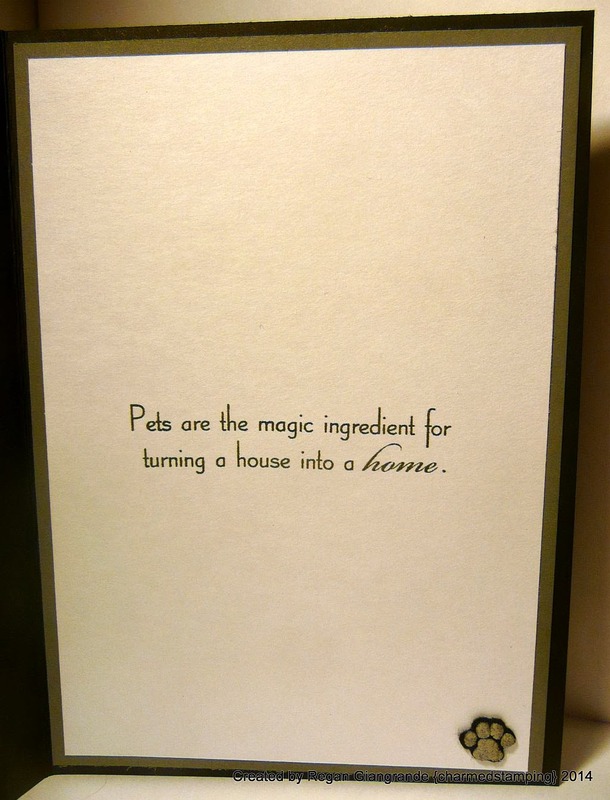 Inside is another MFT's sentiment, this one from their Clearly Sentimental About Pets set. I did accomplish some crafty shopping yesterday. Now the question is do I attempt to organize the craft room today or ignore the mess a little longer and sit down to play with paper...? Decisions, decisions! My son will be home early afternoon so I'd better make up my mind soon. Thanks for stopping by and be sure to visit The Corrosive Challenge blog for more creative inspiration and to play along! Markers used: Copics (N0, N2, N4, N6, N8, R20, R81, R85, RV21). I love the colors you used on this and the wonderful papers. Love the coloring on the darling animal. Not sure if a dog or wolf but it is a darling card. Beautiful card - and your coloring is just perfect! Thank you for joining us at My Time To Craft! Oh, he's a cutie! Such a lovely colour combo, great design and I love the paw prints! thanks for joining us at Sweet Stampin this week. Hi, A beautiful card. A great design and love the colours. Thank you for joining us this month at Crafts Galore Encore. OMGosh I love your card and what a great sentiment too! Thanks for joining us at Catch The Bug! I love the colors and the darling image - oohh and the paw prints. Terrific card! Thanks for joining us this week at MTTC. This is soooo cute! 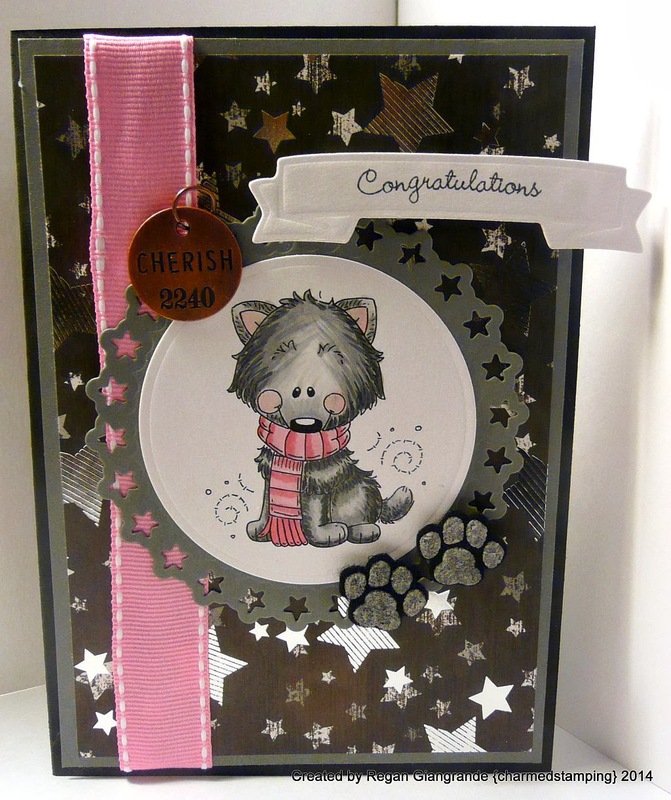 Just adore the great embellishments you have used for this card! Fabulous sentiment as well inside. I'm sure that this will be a great card to remember that adoption! Such a wonderful image and a great use of that sketch, Regan! Thanks so much for entering our "Anything Goes" challenge at Doodle Garden this month. Good luck in the draw and we'd be honored if you came to play regularly in our monthly challenges. Regan, love your new design to your blog! Also, I'm so excited for you that you won a clock from Krista! I had her design some digis of my girls, Allie and Marissa, super cute, so I'm sure you will be over the moon with your collaboration! Your cards always have that perfect touch, like those cute little paws! Love it! Oh my! Your little pup and paw prints are just adorable. Thanks for sharing with us this week at Catch the Bug! 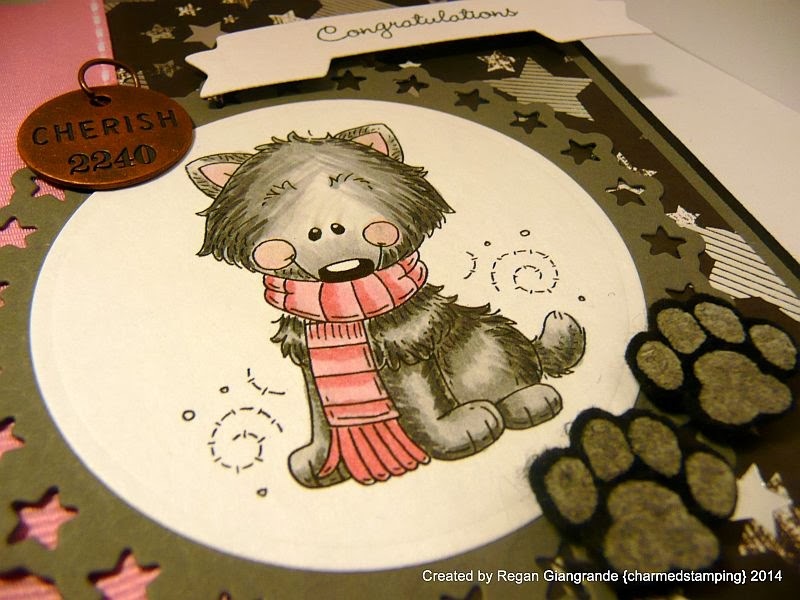 Gorgeous.....love that sweet image & the colours you chose.....the paw prints are just adorable! Thanks for joining us over at Crafty Calendar this month, hope to see you again next time!